The UWP Chart control is optimized to visualize large quantities of data in an elegant way. Its rich feature set includes functionalities like data binding, legends, animations, data labels, annotation, trackballs, tooltips, trendlines, technical indicators, and zooming. 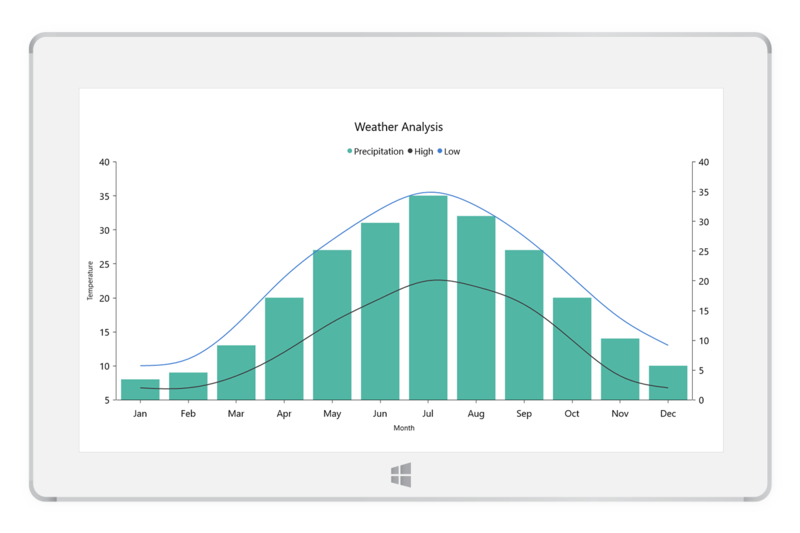 The UWP charts, a mobile friendly easy-to-use charting package, is used to add beautiful charts to UWP apps. It contains a rich gallery of 45+ charts and graphs, ranging from line to financial charts, that cater to all charting scenarios. Its high performing quality helps to render large amount of data quickly in your surface and desktop devices. It also comes with a lot of features such as zooming, panning, tooltip, crosshair, trackball, drill-down, and events to make the charts more interactive. The charts include several data rendering optimizations. It provides the best possible performance when plotting large volumes of data and handling high-frequency real-time data. The charts include functionality for plotting more than 45 chart types. Each chart type is easily configured with built-in support for creating stunning visual effects. Related data can be plotted using bubble and scatter charts. Many area-type charts like area, spline area, and stacking area are available for quantitative analysis. Radar and polar charts can be used for displaying multivariate data. Several 3D chart types are also available. The charts support four different types of axes: numerical, categorical, date-time, and logarithmic. The appearance of all chart axis elements can be customized with built-in properties. Multiple axes - Visualize different units of data with multiple axes, which can be placed at either side of the chart. Opposed axis - When the chart has multiple axes, this feature arranges the axes by moving them to the opposite position from their default position. Inversed axis - Reverse the axis labels and ticks. This swaps the higher and lower ranges of a chart axis. Synchronized Chart - Use multiple panes to show different types of data with multiple chart types and axis, for clear visualization. Customizable labels - Chart provides many customization options for the axis labels, including positioning, placement, label format, and rotation. It also has options for avoiding labels overlapping. Smart range calculation - The best possible axis ranges and intervals are calculated automatically based on the given values. The ranges can also be further customized using range padding. The UWP charts have been packed with interactive features such as zooming and scrolling, trackball, tooltip, drill-down, and selection. You can configure these interactive features using the developer-friendly APIs. Data points can be easily annotated with labels to improve the readability of data in a chart control. Readability can be further enhanced by adding markers or customizable symbols. Legends provide additional information helpful in identifying individual data or series in a chart control. Annotations display metadata about a chart control or series at a specific point of interest in the plotting area. Multiple annotations can be added to a single chart control. Elegantly handle the empty point values in UWP charts. Highlight the specific regions in a chart area using strip lines. Also, add text to describe the highlighted area. The charts support 10 different types of financial technical indicators such as RSI, momentum, Bollinger bands, accumulation distribution, EMA, SMA, stochastic, ATR, MACD, and TMA indicators. Chart has built-in support for rendering linear, exponential, logarithmic, power, and polynomial trendlines. An axis scale break allows users to view different ranges in the same chart area without having a huge space in the plot area. Rotate all the series types to plot data in a vertical direction and view the data from a different perspective. Data points with similar categories can be grouped and aggregated using aggregate functions. Localize all the static text within the chart control to any desired language. The chart can be printed and also be exported into image formats like JPEG, BMP, PNG, TIFF, and XPS.